After three blank sessions in a row on the river Dane I decided to pay the river Bollin a visit hoping that a change of scenery would produce a better result. 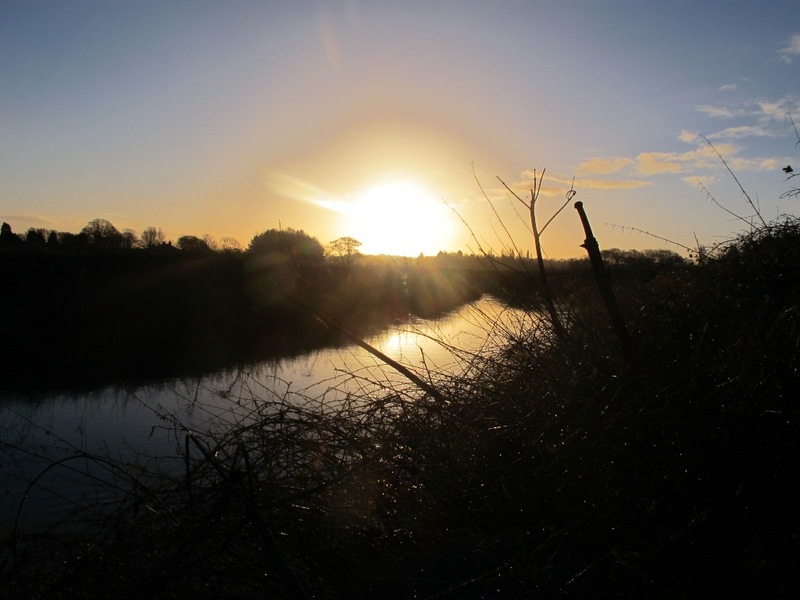 I’d enjoyed my Christmas trips to Daisybank and was pleased to meet up with other anglers taking advantage of the festive break but with most returning to work on the 2nd of January I headed off at a leisurely pace and arrived at the car park to see a welcomed sunrise. 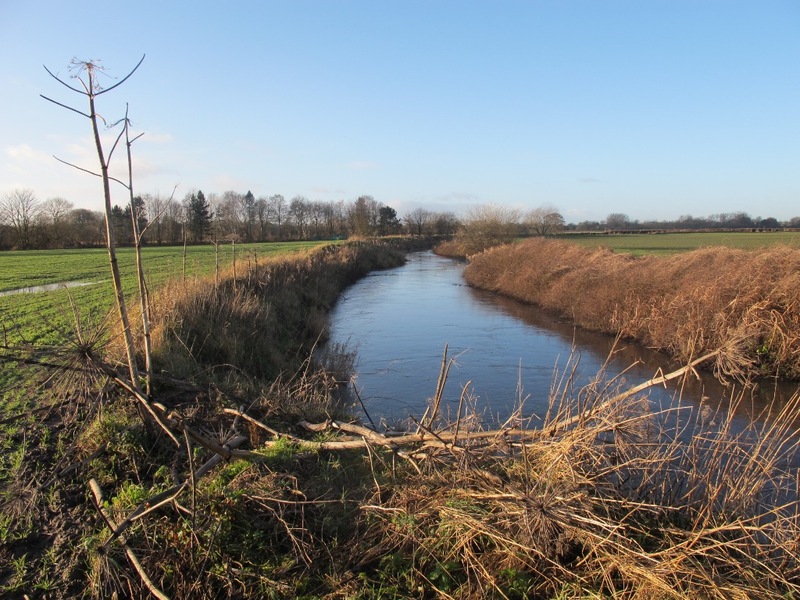 This is what Wikipedia says about the Bollin – The River Bollin is a major tributary of the River Mersey in the north-west of England. It rises in Macclesfield Forest at the western end of the Peak District, and can be seen in spring form, from the Buxton to Macclesfield road. 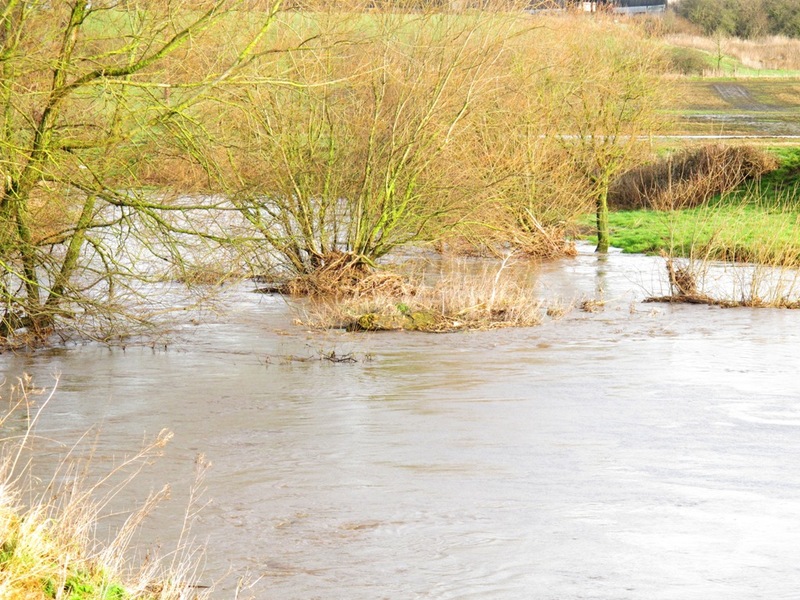 The stream then descends the 10 miles (16 km) through Macclesfield and Wilmslow where it has a confluence with the River Dean, near to Styal Prison. 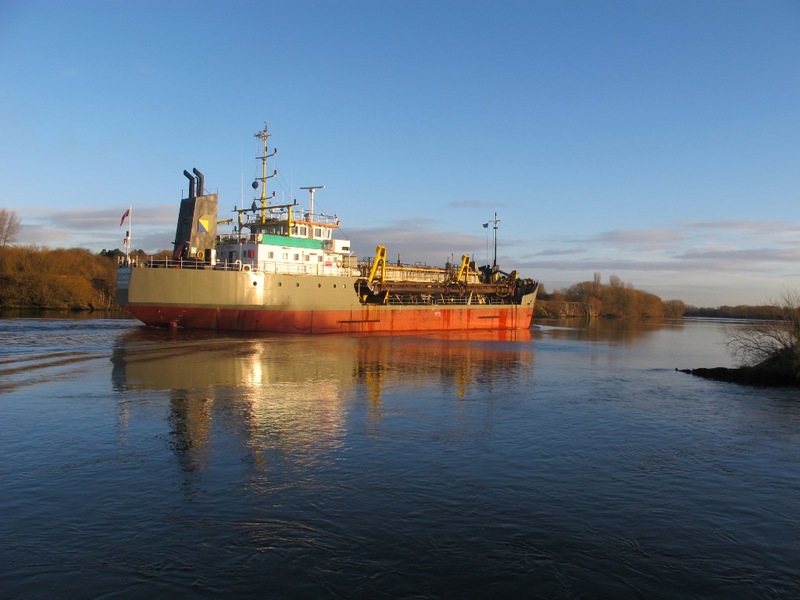 For the following 10 miles (16 km) it defines the southwestern portion of the border between Greater Manchester and Cheshire before merging with the River Mersey north of Lymm. 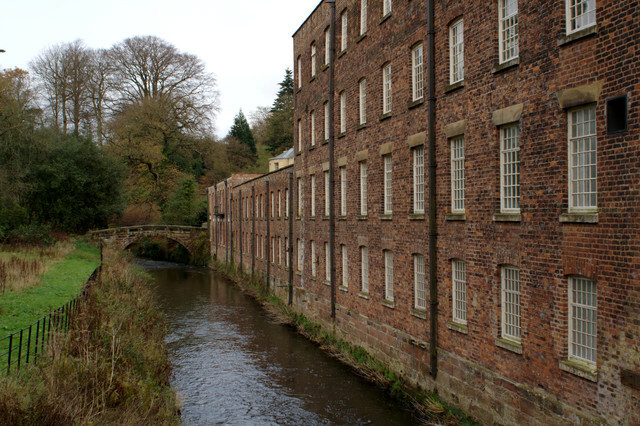 It flows through the Styal country park and was used in the cotton calico factory there, Quarry Bank Mill, as a source of power. 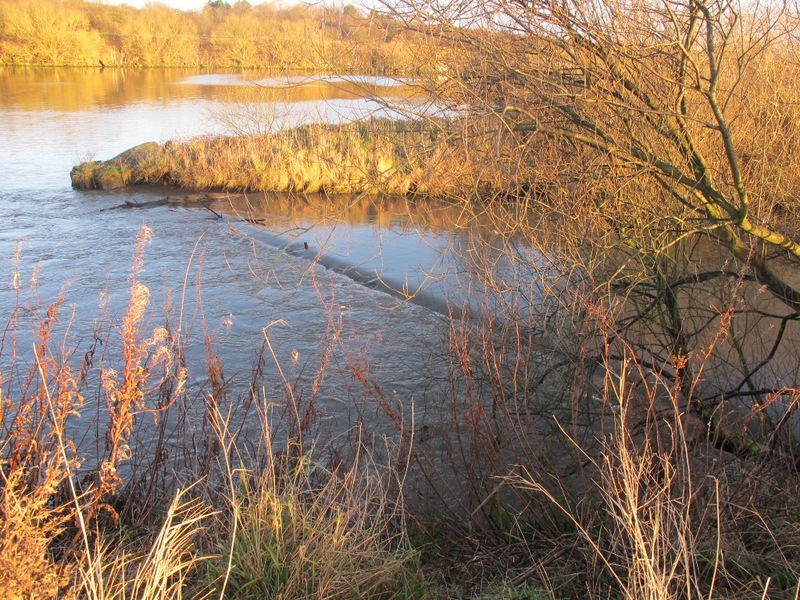 Near to the Quarry Bank Mill site there is a natural weir. The Bollin is culverted underneath the southern runway of Manchester Airport. 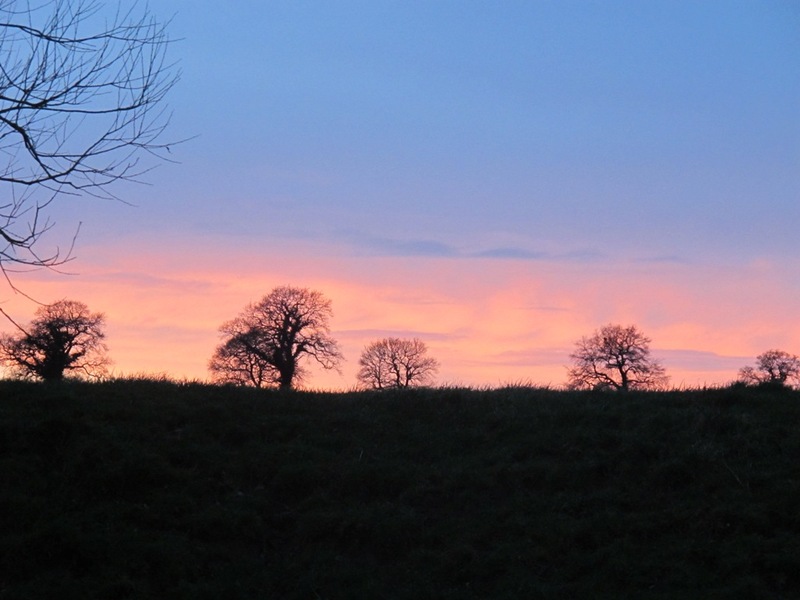 The town of Macclesfield used to dispose all its waste and sewage into the Bollin. The profusion of human sewage in the Bollin was still around in 1850. The club car park is midway along the stretch so I decided on a brisk walk downstream to get the blood circulating whilst peering through the thick brambles for possible signs of a swim. 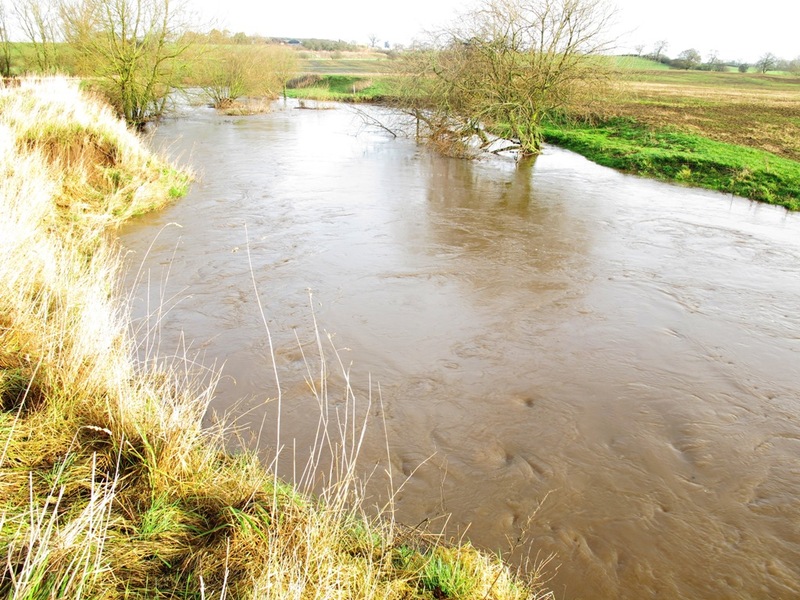 The river was well up on normal levels at 1.7m however I was surprised at how sluggish it looked in comparison to the Dane, it was coloured and my hopes of catching were slim to none as this stretch is notorious for beating even the most hardened of angler. However I’m not an angler that see’s his glass as half empty and if there’s a remote chance of presenting a bait I’ll have a dabble and see what happens, after too much over indulgence I took the view that this session would be a chance to get out in the fresh air and explore a new venue. Reaching the end of the stretch I was curious to see how it joined the Manchester Ship Canal, the truth was it just does, there isn’t anything more than a submerged wall over which the river falls into the canal creating a weir effect when the levels are up as they were today. The end of the river Bollin where it runs into the Manchester Ship Canal. The canal is extremely wide and industrious looking, as you’d expect, and as I stood taking photographs I heard the thud, thud, thud of an engine. 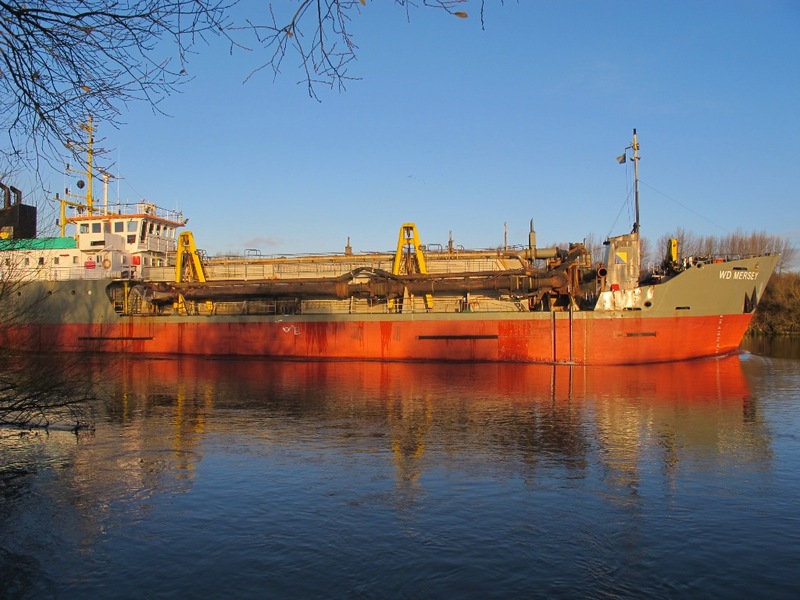 Turning I was a little startled to see a huge ship plodding away up the canal creating a bow wave as it passed the mouth of the Bollin. I spent the morning downstream of the car park and found if difficult to hold bottom with a 2oz lead, it was deceptively slow on top but the added depth gave strength to the undertow, this coupled with every tree branch and leaf in Cheshire making its way downstream made the fishing difficult to say the least. I persisted until dusk when it became clear the chances of catching a fish were very unlikely so whilst most ‘normal’ anglers would have reached the car and packed up I used the opportunity to defrost my chilled bones and have a quick cup of coffee and a sandwich in the warmth of the fishing wagon. Fully refreshed I headed off upstream, it was dark by now but I’d walked the entire length before fishing and knew approximately where I was heading. The inside of a left hand bend provided my home for the next few hours, cheese paste on the hook and little pieces chucked in as free offerings, surely a big chub would be taking refuge just under my rod tip? Perhaps it was because I had a few twitches over the next few hours, a sign that the fish hadn’t all fallen downstream in a flood and ended up in the canal or maybe it was just a drifting branch plucking on the line as it passed. 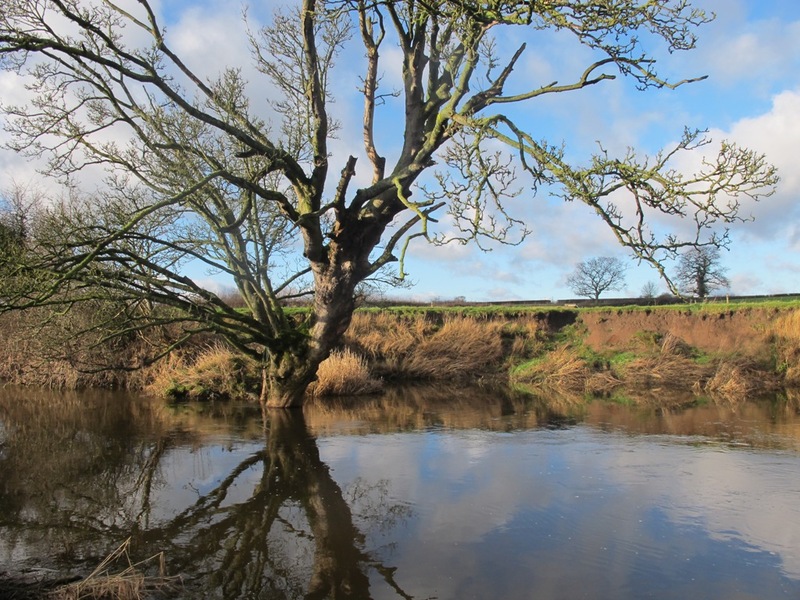 I called it a day at 10pm, the wind was up and the Bollin had decided not to be kind to me on my first visit but there’s something very alluring about this river that will no doubt see me return, perhaps when the levels are back to normal. Checking the levels of the river Bollin it came as no surprise to find it was well up once again however the river Dane was just about perfect so arriving around 11am I started off in the swim before the gate. 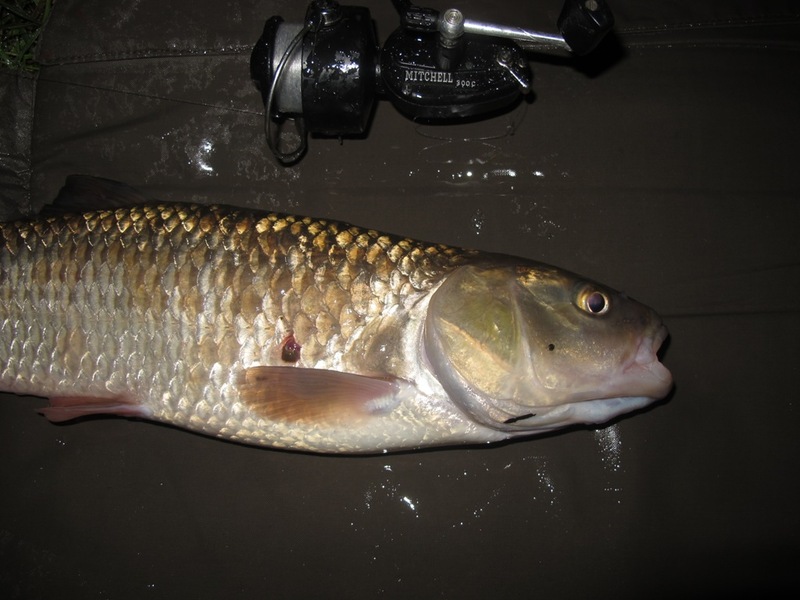 As usual I planned to stay well into darkness as this is generally when the chub gain confidence and start feeding. Starting off on meat I had one rod positioned mid-river on a light lead and the second tight into the near margin, I figured that an early fish would satisfy my needs and I’d then drop down to one rod for the remainder of the day. After an hour I moved downstream to the swim before the island where I was joined by the two swans and their signet, in previous years I’ve seen as many as five off-spring but this year just the one followed mum and dad onto the sandbank opposite. My next stopping off point was going to be the downstream island swim however a chap fishing the opposite bank and landing a nice looking chub put paid to that idea so I continued to the next swim on a nice deep bend, I’d had a few fish from this swim in the past so I was soon cast in and trundling a big chunk of meat under the branches of the over hanging tree. 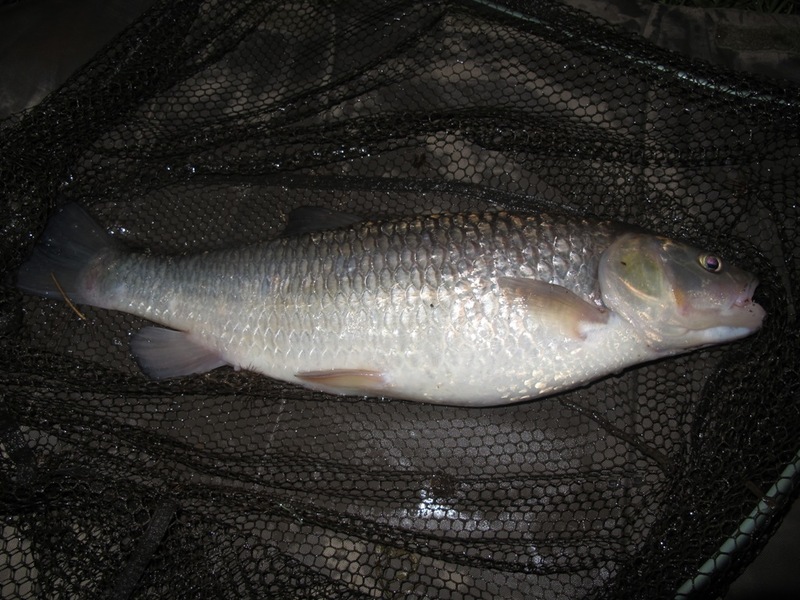 Within ten minutes a steady pull on the rod tip and I lifted into a nice chub, it snagged up in the submerged branches of the tree but I managed to coax it out by dropping the rod tip underwater and taking it steady. 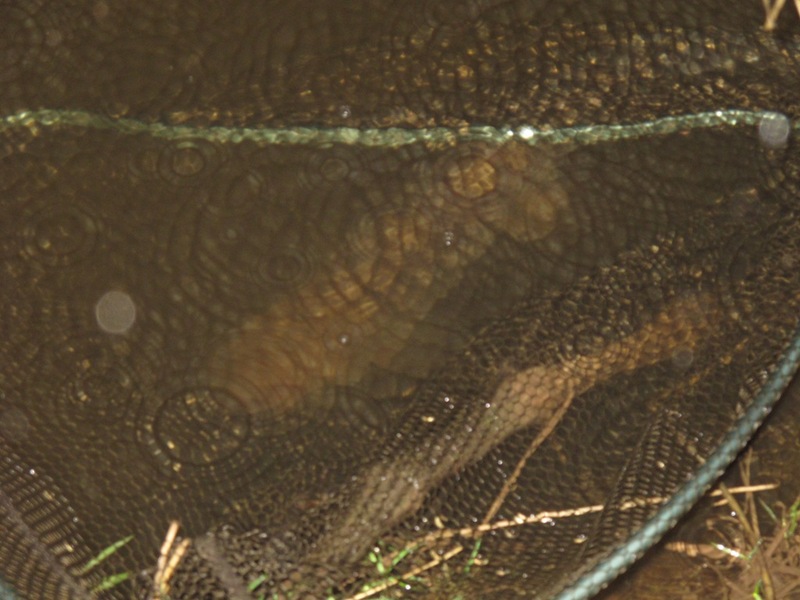 In the net it looked a good fish, certainly one for the scales. 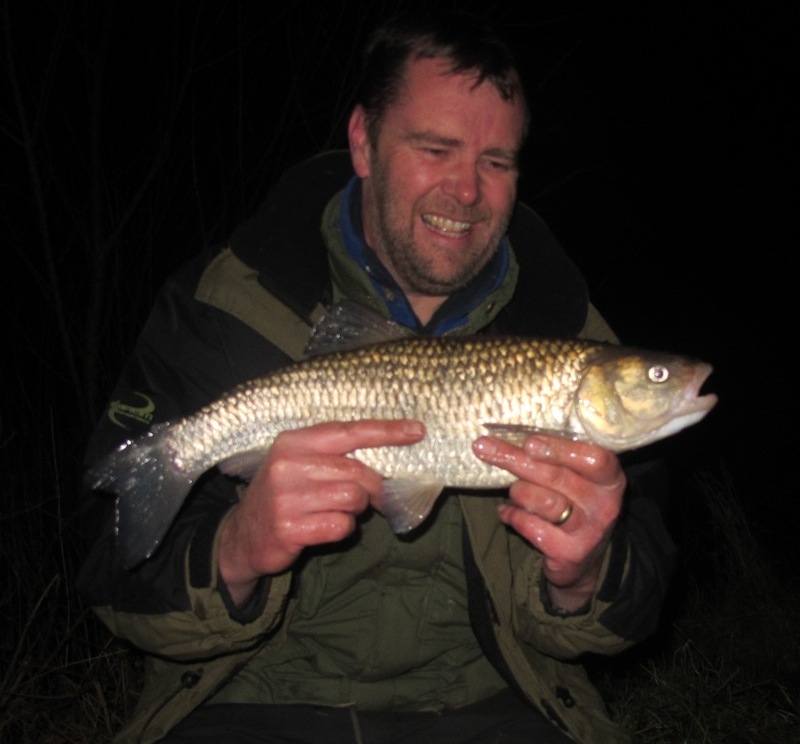 The Avons confirmed it as 4lb 9oz which was certainly a new PB for the Dane so I was rather pleased. I knew the swim would be quiet for a while and it was soon going to be the ‘witching hour’ so I had a dabble in a couple of swims before heading to my final swim for the remainder of the evening. The final swim is a deep bend that doesn’t have reputation for producing good volumes of fish but with the notable drop in temperature I figured it was as good as any other on the stretch. The evening swim, looks very fishy but never really produced for me in the past. Almost from the start I had interest in the swim, a pluck every now and again reassured me that I’d made the right decision. It was completely dark by 5pm and ten minutes later a few vibrations through the line crooked over my finger and the rod was off, a short but enthusiastic fight ensued and it was soon in the net, I didn’t weigh it but I’d say it was good 3lber. Now logic tells us that once a chub has been caught unless you release him 14 miles downstream of where he was caught he will immediately go back and tell all his mates so on small rivers like the Dane you should generally pack up and move to a ‘fresh’ swim however I really was enjoying the evening and having had two fish so far decided to stay put. I was glad I did when an hour and a half later I was in again, this time a lovely conditioned 3lber the result. 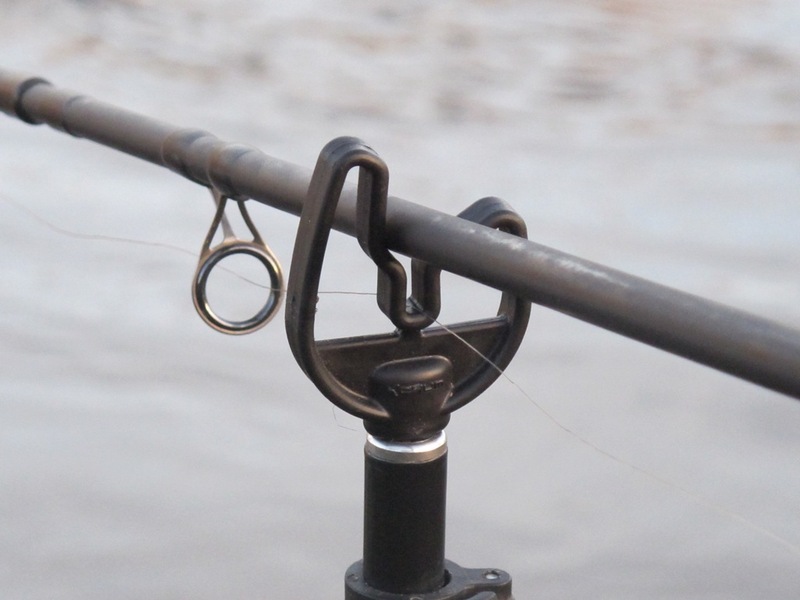 I’d found that during the original fight the line had become tangled with my isotope and whilst sorting it I dropped the holder in the grass, with no chance of finding it and wanting to fish on I found a plaster in my bag and made it ‘better’……….there, there, there. I had to wait forty minutes for fish number four, this time it looked every inch a 4lber so the scales were dug out and the fish duly weighed, it was spot on 4lb. 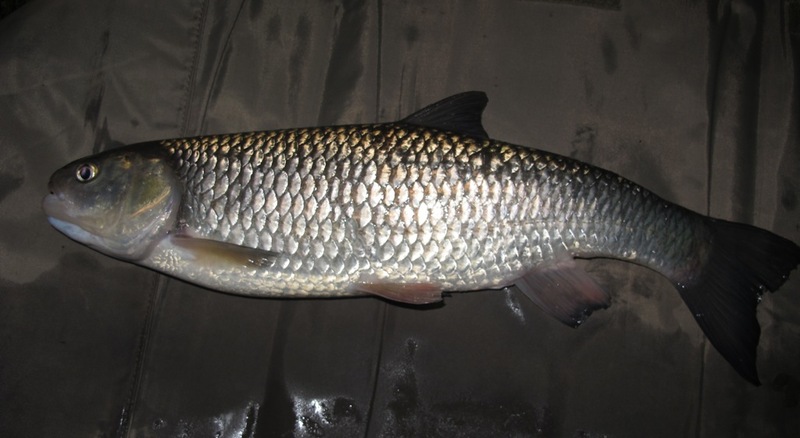 That concluded a very satisfying days fishing and I’d learnt that chub can turn up in unpopular swims and multiple captures are possible if you remain quiet and return them 14 miles downstream!! 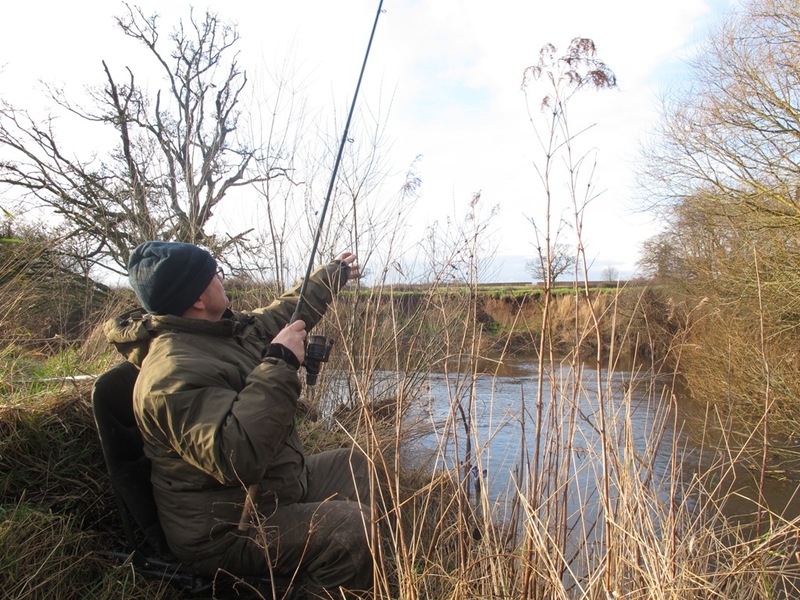 The following week I met up with PhilH who’d had a rather uneventful trip to the Wye for new year, he’d found it unfishable and in flood as was the case with most rivers in the UK. We headed off as I re-told last weeks escapades, of course I headed straight back to the same swim whilst Phil dropped into the bend where I’d had my 4lb 9oz PB. I had a new toy which I’d mentioned on the walk down the hill but as I hadn’t revealed exactly what it was a rather intrigued Phil came over shortly after to find out. I was just setting up so without much of a fuss I took it out of its rod bag and proudly filled him in on the details. 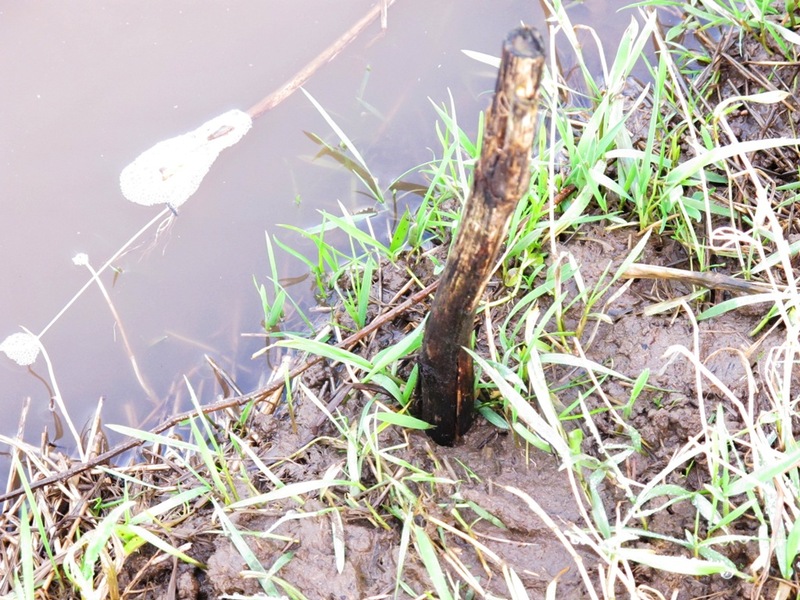 It was an eleven foot 3 piece split cane rod which I’d acquired over the Christmas period from Ebay. 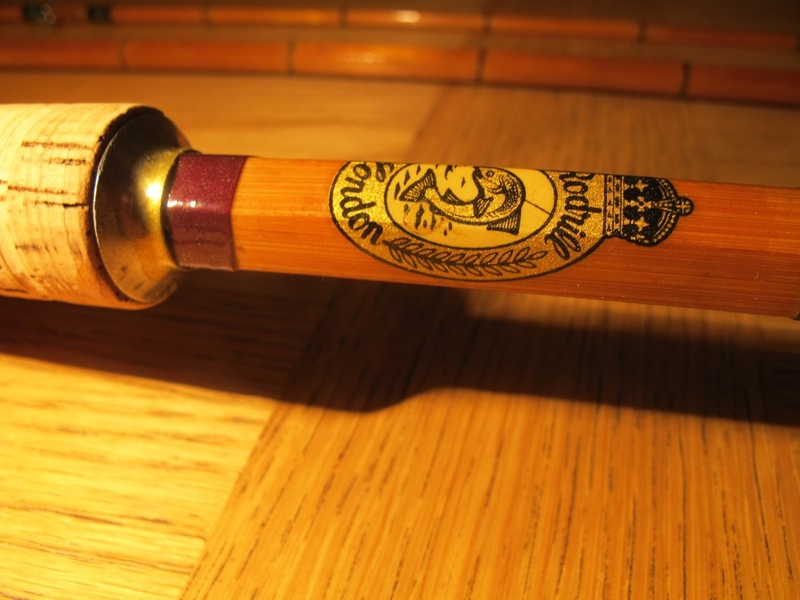 The rod made by Rodrill of London, was probably as old as me, getting on for 50 years and had recently been restored to a reasonable standard. I’d joined the Traditional Fisherman’s Forum after reading a few books on restoring old tackle and it really appealed to my nature. 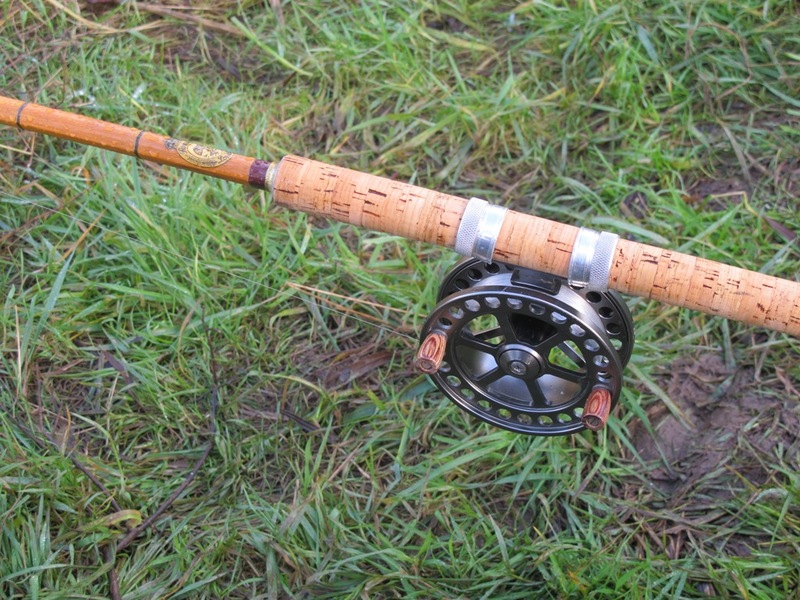 My aim was to ‘give it a go’ so the rod was purchased for the princely sum of £77 plus delivery, a bargain in my view and a means to give it a try without breaking the bank on a more expensive Hardy’s rod which can go upwards of £200 to an enthusiastic collector. 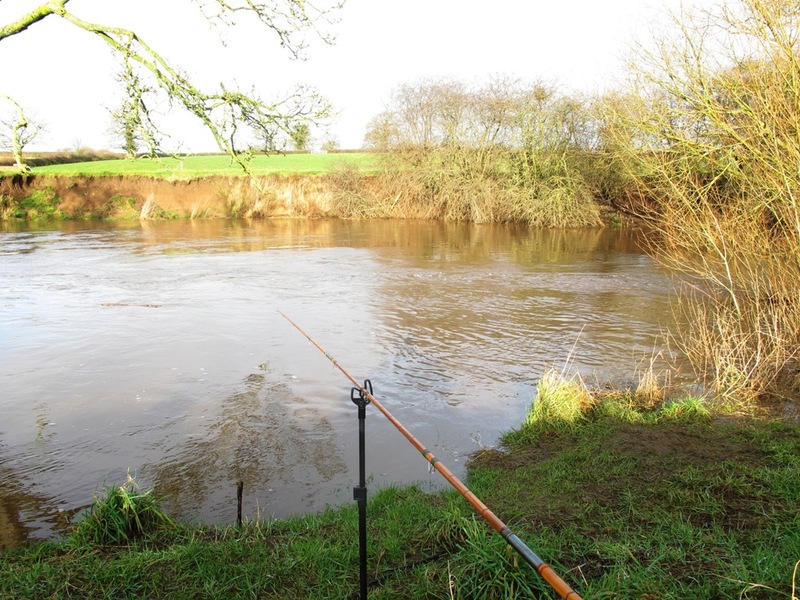 I’d spent some time talking to a chap on the forum who’d restored a few of the Rodrill’s and he’d advised they were perfect for chub and barbel on small rivers rating the test curve at somewhere between an Avon rod and a pound and a half barbel rod. He’d also researched their history and believed that at one point the blanks were supplied by R Chapman & Co so it could well have come from the big boys stable but I really didn’t buy it just to admire and wanted to use it for the purpose for which it was intended. 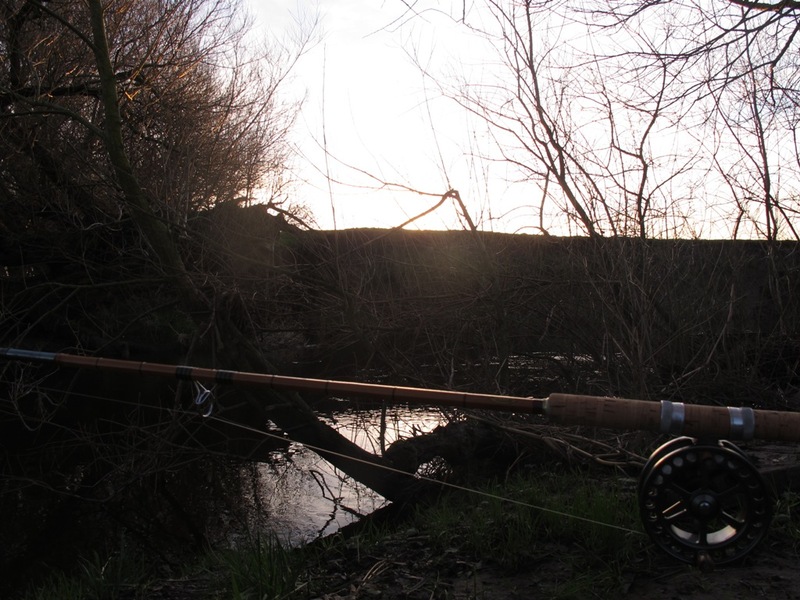 The rod was complemented by my trusty, albeit modern, centrepin and looked rather good set up and ready to fish. Phil returned to his swim after admiring my new toy and giving it a good waggle and I cast out for the first time feeling very ‘traditional’ in fact I thought it very fitting to have a slice of cake with my morning coffee and savour the moment. No sooner had I poured the coffee than a phone call from Phil saw me reeling in and making my way back up the field with my camera in hand. 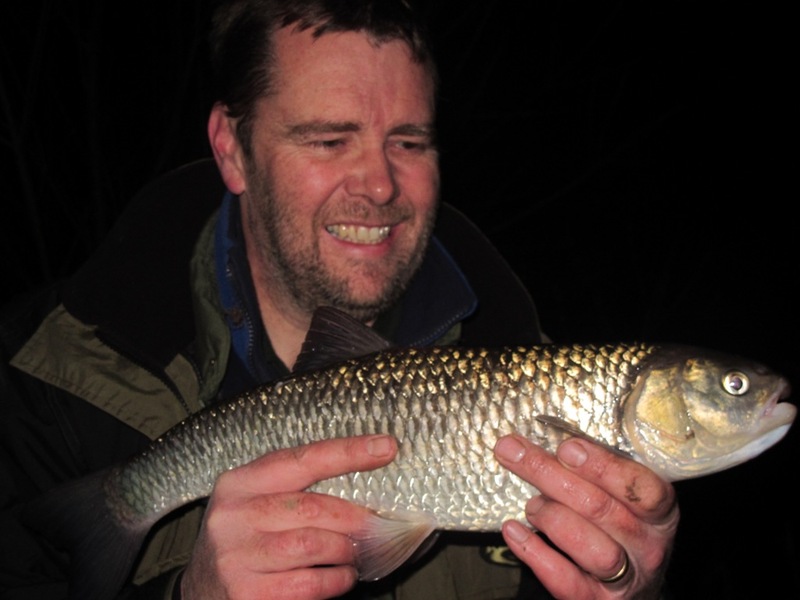 He’d managed a chub second cast and what a lovely specimen it was, 4lb 2oz on the scales and a very pleased PhilH posed for the photo. The early fish had raised our hopes of a repeat performance of last week and we continued to fish throughout the day until at around 3pm Phil wrapped up and headed home. 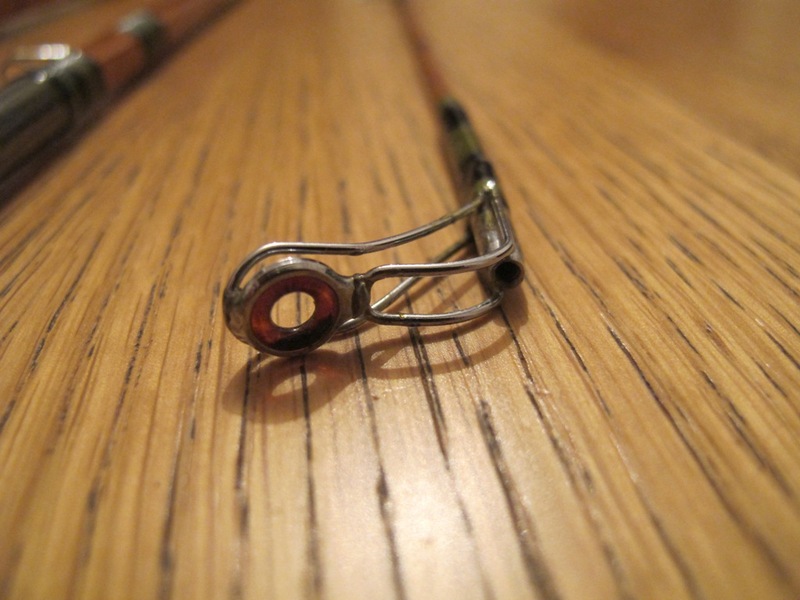 I on the other hand see 3pm as the half time whistle and was determined to have my first feel of a fish on split cane, would it be notably different to modern rods? Would it break under the strain? 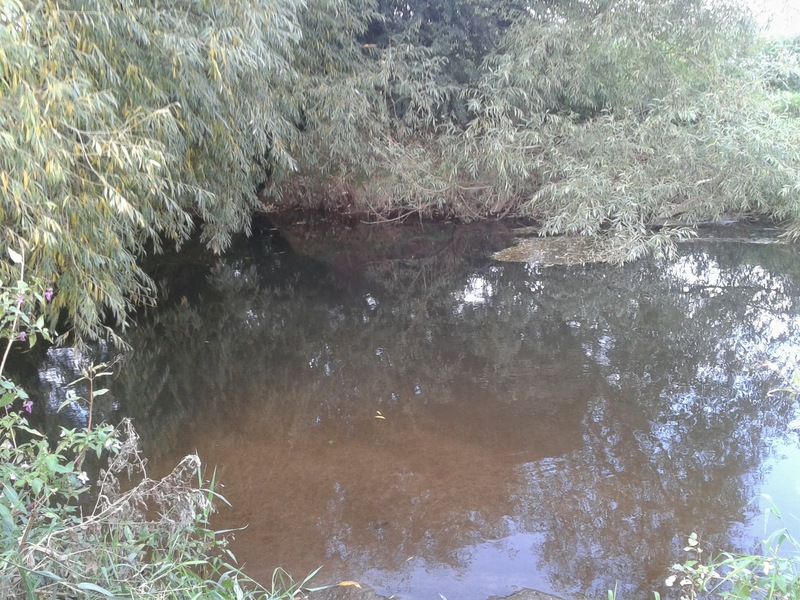 Too many questions needed an answer so I did what all good anglers do when faced with such a dilemma and headed to the ‘Sandbank’ swim were previously frantic sessions had seen multiple chub and barbel almost chucking themselves on the hook. Anyway there I was on the Sandbank swim cane and pin, free lined cheese paste and not a care in the world when the mobile phone rings, it was Shaun asking how we’d done so far. I was just explaining my new-found passion when the rod tip lurched over and I grabbed the rod striking whilst simultaneously throwing the phone in the sand and shouting ‘Yes I’m in! !’ sadly it turned out to be a pluck of all plucks, the rod clattered with the tree branches above as I realised I wasn’t connected to anything. I called Shaun back to relay the whole episode and we had a good laugh about it but I still hadn’t had a fish and it was getting dark. Settling back into my swim for the night I decided to put the tip rod out as well as the cane rod thus doubling my chances of a fish. I had the cane rod to my left downstream and the tip rod out in front both on a big chunk of meat, this proved a good move when at 5:45pm the tip rod gave a steady pull around and I lifted into my first fish of the session. 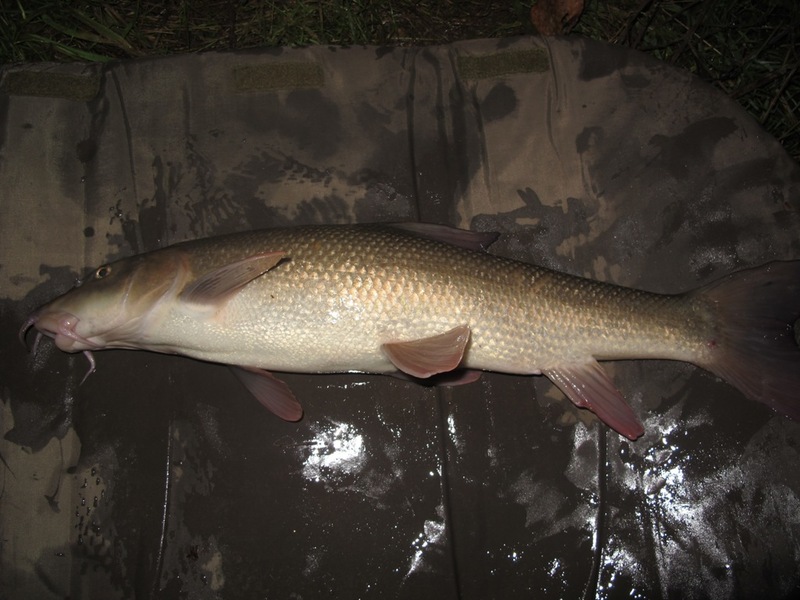 Straight away I could tell it was a barbel, the run downstream followed by a number of jagged runs under the rod tip confirmed my suspicions but eventually I had it on the bank a pristine barbus barbus of around the 6lb mark. 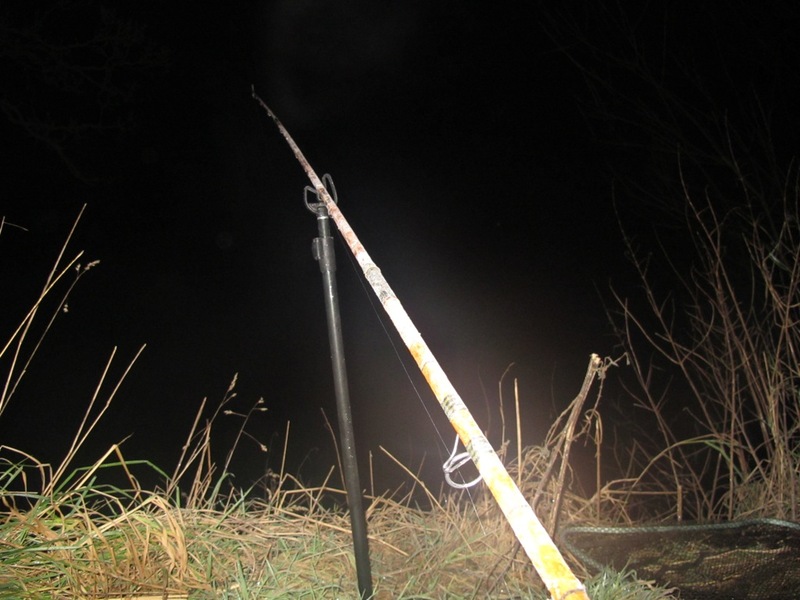 After a good rest in the net I watched him swim off under the light of my head torch and recast the tip rod to the same spot. What happened next was a little unexpected but I reeled in the cane rod and changed onto cheese paste. 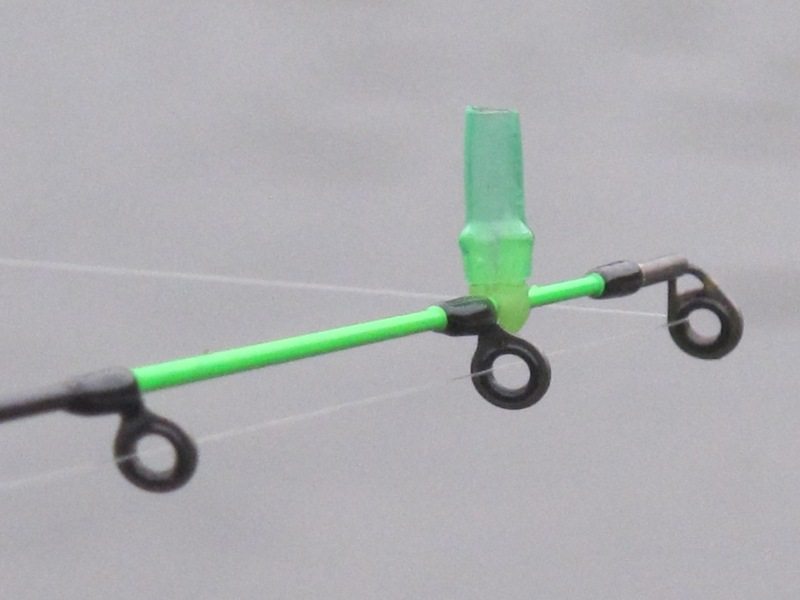 I’d been feeding the marginal area to my right for an hour with small pieces of paste and as I’d not long recast the other rod I decided just to cast the cheese paste under the tip rod and put it back on the rest. What I didn’t realise was I hadn’t turned the side strike head around to face upstream. 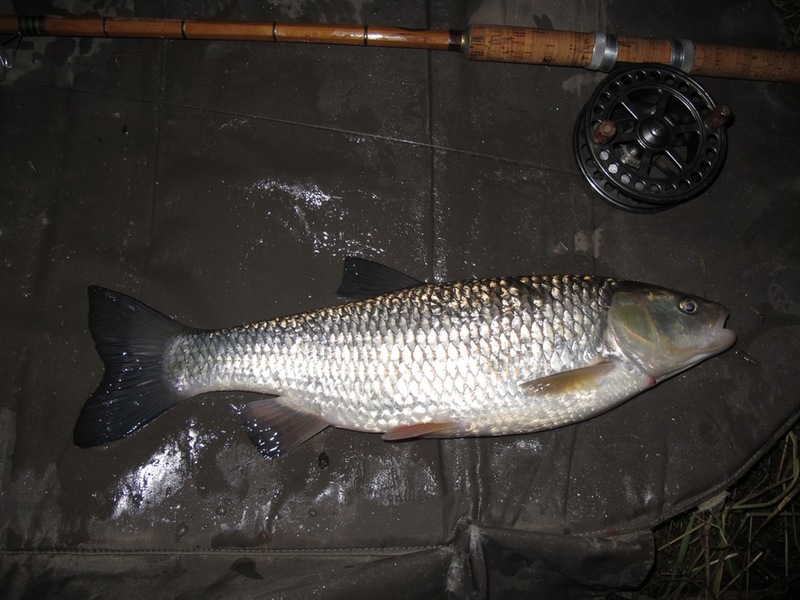 It was almost 8pm when the cane rod was pulled unceremoniously off the rest and clattered onto the bank, I managed to grab it before it disappeared and found myself attached to a very feisty chub. It eventually came in without a fuss but not before I’d test driven the split cane rod which proved every inch a most excellent chub and barbel rod a lot of tip action but I felt it would cope equally as well with a big barbel should the opportunity arise, the centre pin complimented the rod well and I was grinning from ear to ear as the 3lber lay next to the rod and pin for the mat shot. This was to be my final fish of the evening and the temperatures had dropped coating everything around me in a frost so I packed up and headed home at 10pm, mission accomplished!! 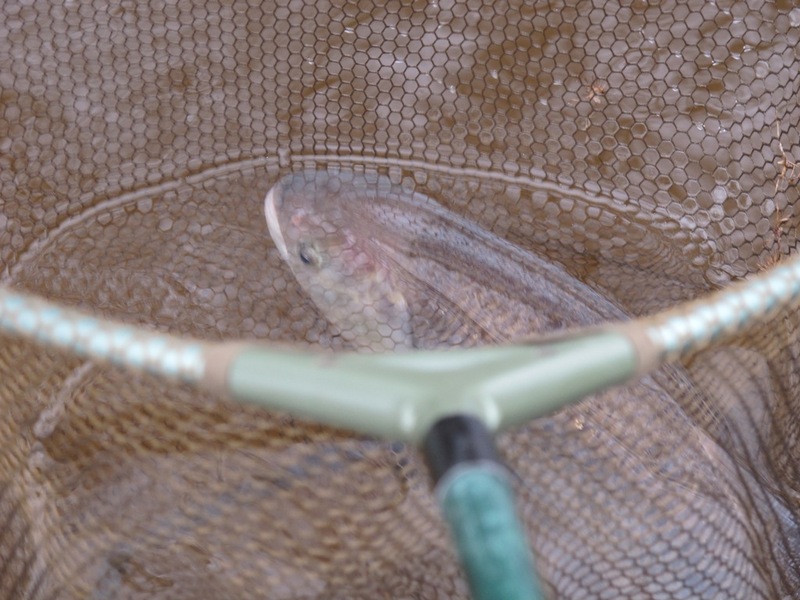 The following Saturday I headed straight back to the same peg, I wanted to see if the past few sessions had been lucky or if you really could target the local residents and draw them into your swim. 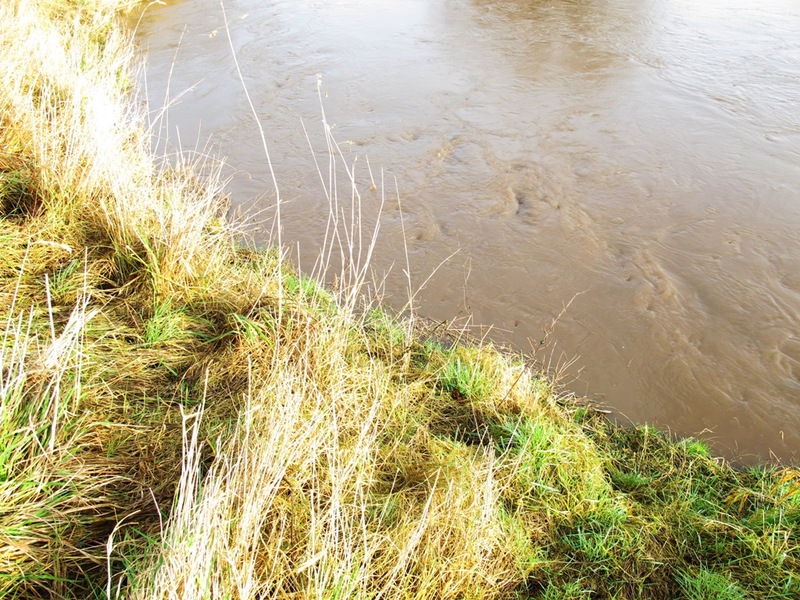 I was setup and fishing for around 10:30am when I heard an almighty thud behind me, looking around from my brolly I saw it was Billy who’d ‘slipped’ into an upstream swim and dropped all his gear in the process. I hurled some abuse about being quiet, as you do, and he came over for a chat. 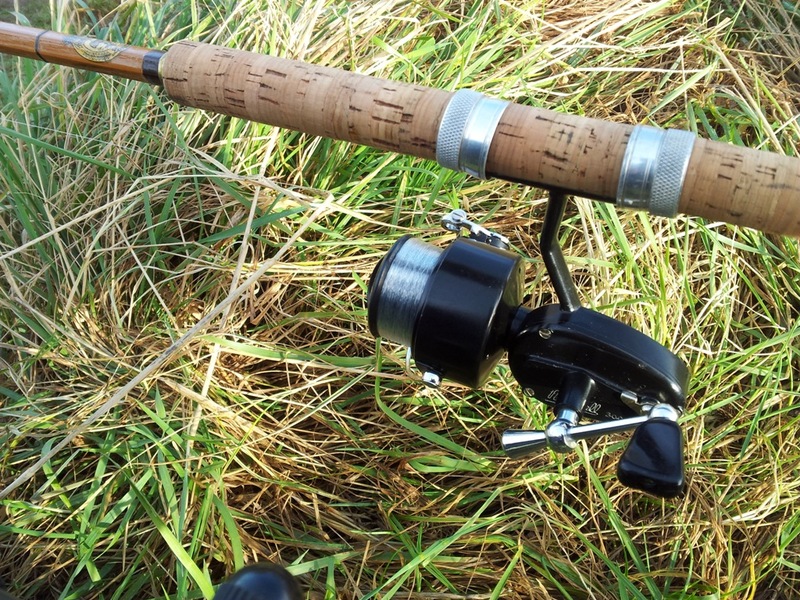 Billy is ‘old skool’ and my recent rod purchase was discussed in a ‘I remember my first cane rod’ way but what really caught his eye was my even more recently purchased Mitchell 300C reel, made in 1983 it sat well on the long cork handle and didn’t look out-of-place. 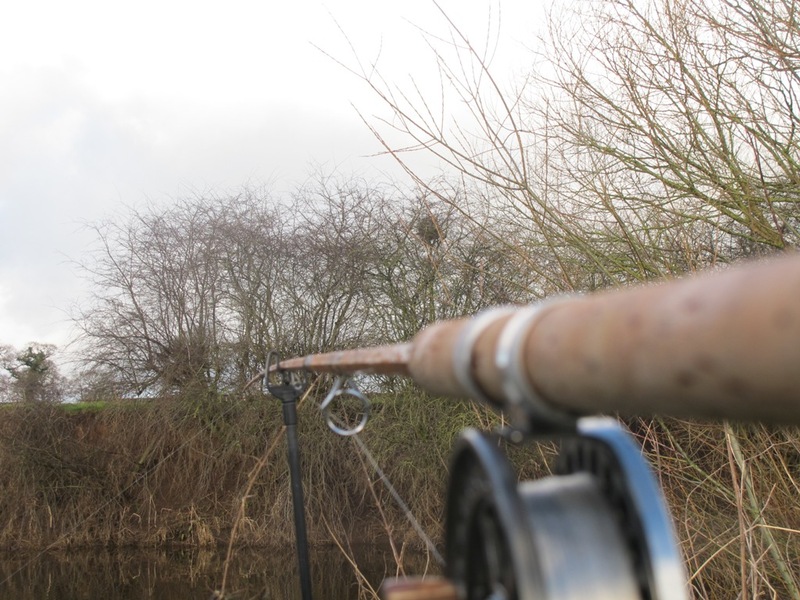 It came with 2 spare shallow match spools and apart from a good clean up was in very good condition for its age of 30 years. 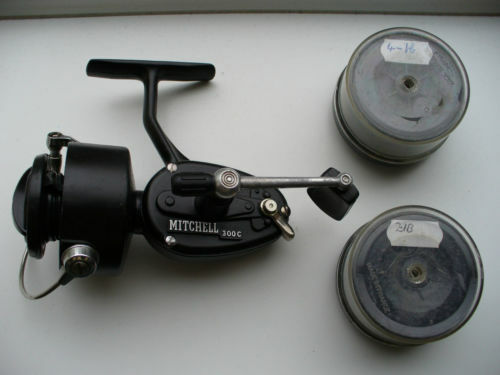 I’d also purchased a couple of earlier Mitchell 300 reels as well as an ABU Cardinal 40 and my inquisitive nature and engineering background soon had them in bits on the dining room table much to the disapproval of Mrs Roberts but I like them and I like using them so the plan was to have a first fish on the cane rod and Mitchell reel. As a young lad my first reel was a Mitchell 208 bought around 1978 and kept in a brown zip up reel case along with the original manual and a small tube of sewing machine oil, sadly I fear it has been lost in a house move but I’m yet to check the attic and you never know I might just have kept it for old times sake. Although they are collectable they aren’t expensive and reading the Mitchell Reel Museum web pages I wasn’t surprised to learn that they started making reels in 1947 and by 1990 they’d manufactured over 30 million reels in various guises, this means there is an abundance of reels available in many different forms and I considered £21 a bargain for this 30-year-old 300c. 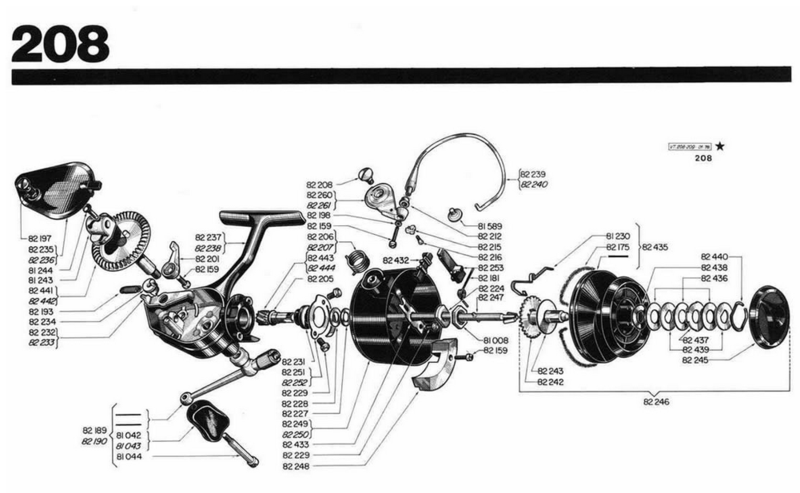 The mechanics of the reels are similar, even the ABU Cardinal I bought is mainly cogs and plates, nothing complicated and very easy to service yourself with a bit of patients and a schematic diagram which are easily available on the internet. 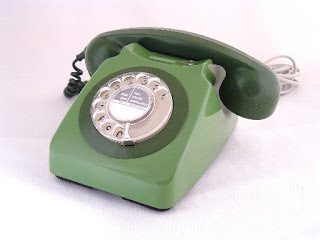 I digress but I’m fascinated by the history of these things and will shortly be writing about my traditional approach to angling in its own category on this Blog. Separating this from my monthly diary will enable readers to pick and mix the reading as I’m sure most will think I’m losing the plot but you only get one stab at life and I intend to make it as enjoyable as possible. 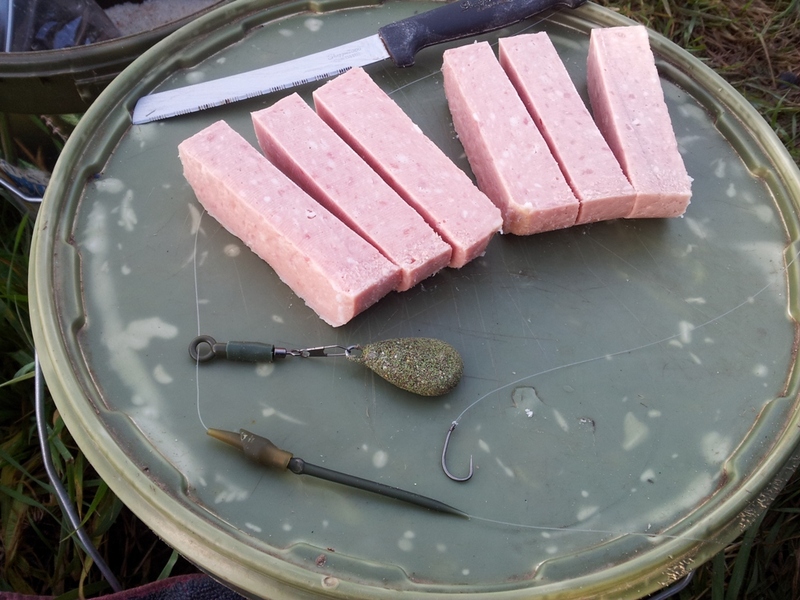 Back to the fishing, I remained on cheese paste and continually fed the swim with hemp, the river was up a little on normal winter levels but a good colour and I thought our chances were reasonable to good. 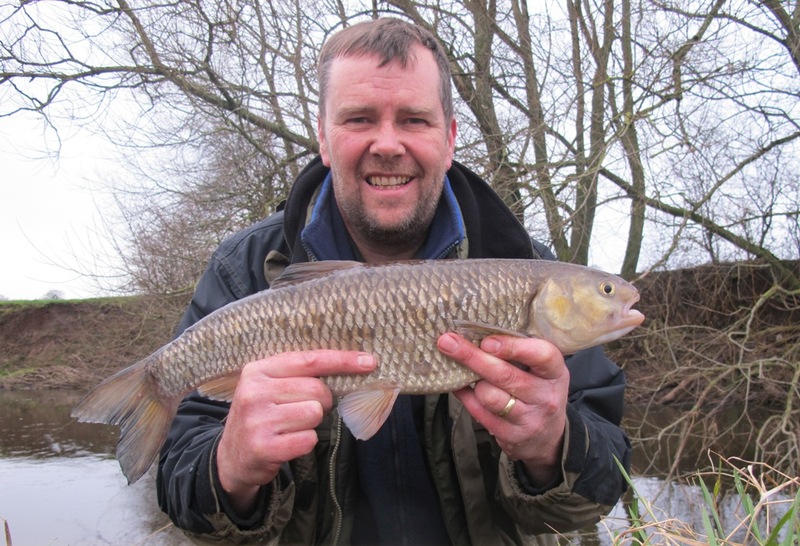 Billy had a chub further up-stream and was using the same tactics although he’d also brought meat and maggots. I went over after an hour for a chat and we agreed that we should at least have a couple from the area which looked very ‘chubby’. At 3pm Billy headed off home and I gathered the basics for a spot of roving. I dropped into the swim upstream where Phil had his 4lb 2oz the week before and I’d had my 4lb 9oz the week before that, the best approach being to cast straight ahead avoiding the far bank snags and letting the flow take the bait under the overhanging trees and into what we think is a deep slack. 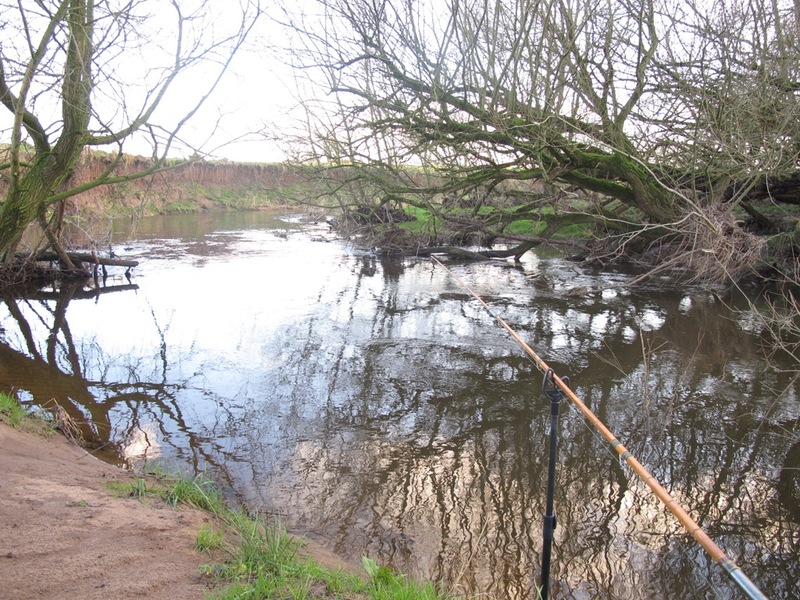 In summer the swim is simply stunning but in winter it just looks bare and fishless, you have to be really careful not to make a noise when setting up or getting to close to the water’s edge as this usually spooks the fish. 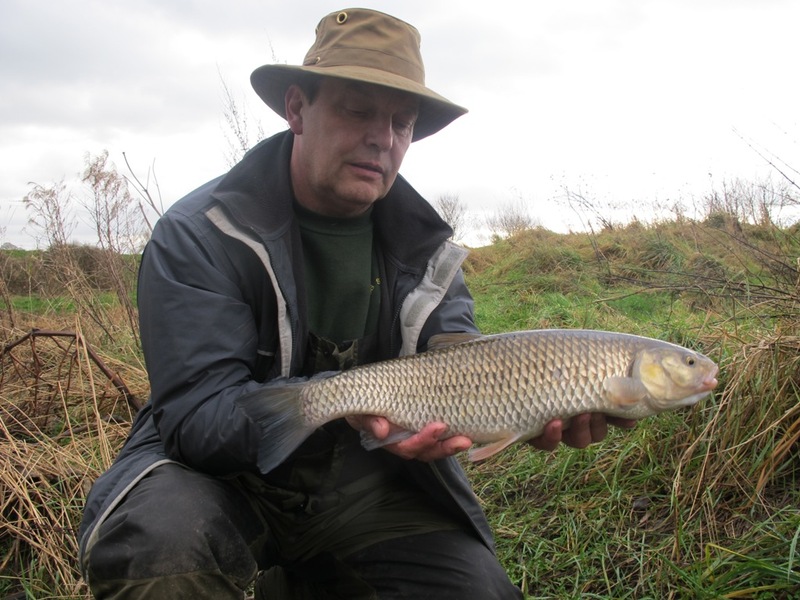 The classic chub swim in September, plenty of cover for both angler and fish. This went on for an hour without a touch until I headed back to my base and set up for the evening. 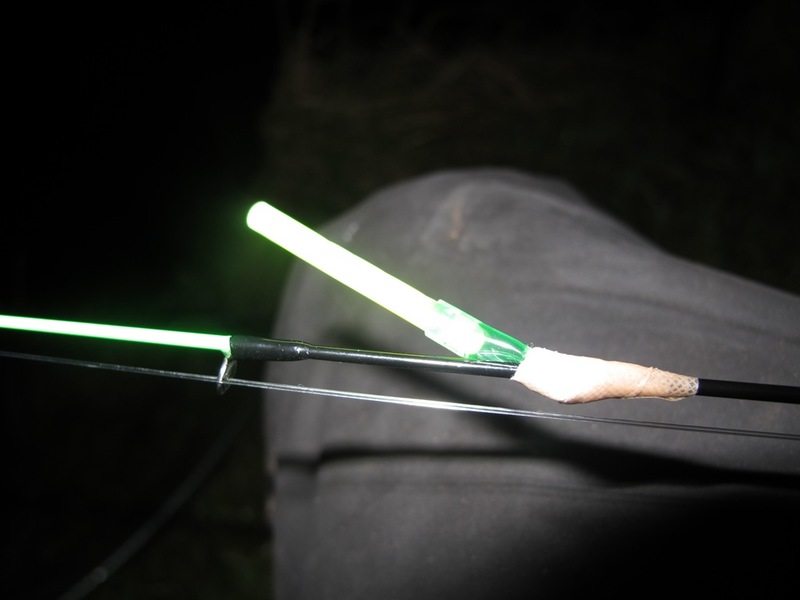 I’d purchased a 2oz quiver tip that screwed into the tip ring on my cane rod and I’d whipped on a nite-lite holder so started the evening session as darkness closed in around 5:30pm. Over the next three hours I continued to recast every twenty minutes with a small cage feeder filled with bread crumb and alternated between meat and cheese paste on the hook. By 10pm I was residing myself to a fishing ‘fail’ when the rain started so not wanting a soaking on the long walk back to the car I sat it out and waited, and waited, and waited, it was now 12:30am and I was starting to wish I had my bed chair and sleeping bag. 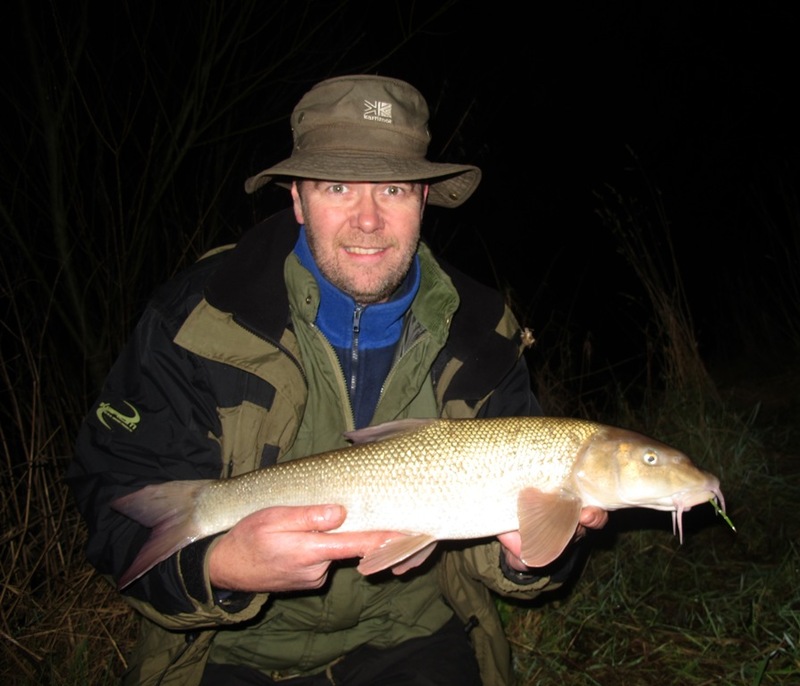 One last cast and the rain continued but at 1am the tip pulled round and it seemed the long waiting game had paid off. 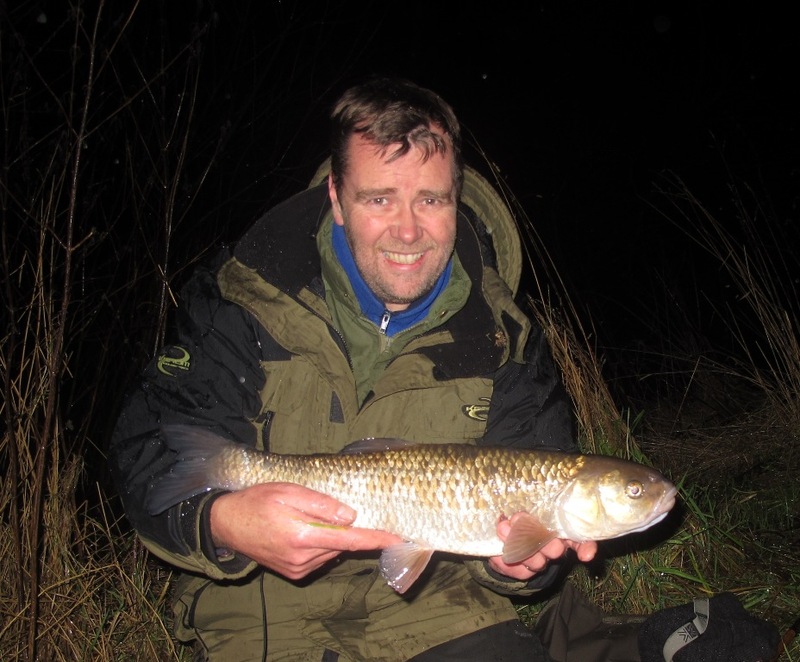 I made the most of the fight using the back wind on the Mitchell rather than the clutch and again the tip of the rod indicated it was a chub rather than a barbel. Eventually it was in the net and although the rain continued I didn’t care as I set up the camera whilst old chevin rested in the margins. It was a scrawny looking lean fish of possibly 3lb, it had a scale missing and seemed hollow in it’s belly but it didn’t matter as once again I’d achieved what I set out to do and had my first fish on the 30 year old Mitchell 300c, no dramas just great fun!! When the odds are stacked against you!! Mid week preparation for the final session in January was no different to any other, the tackle was fettled and ready, the bait taken out of the freezer and the hemp freshly cooked. 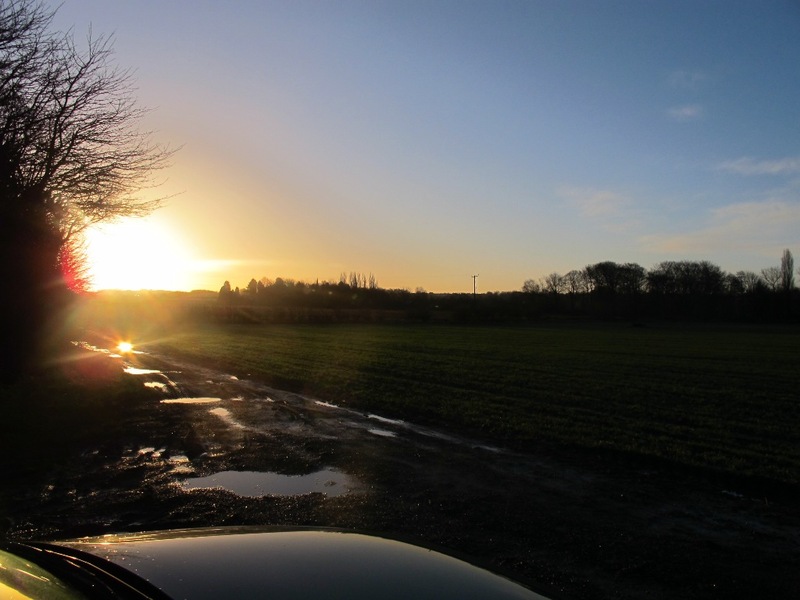 The weather site said rain in the afternoon and the levels were steady as of Thursday. Earlier in the month I’d noticed my nylon brolly had started to leak under heavy rain so I took a gamble and bid on a new fiber lite type on Ebay, I won the auction for the grand total of £25 including postage which isn’t bad considering the buy it now price was nearer £50. It arrived on the Friday and I opened it up in the living room (was that were it all started to go wrong?) it seemed reasonably well made and the skin felt much more waterproof than the trusty old nylon so maybe I had a really good replacement brolly after all. 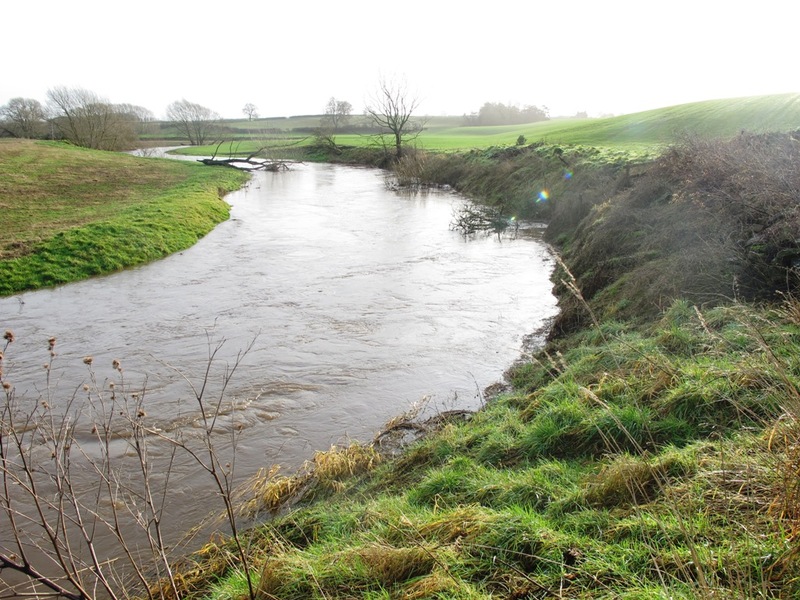 I checked the levels on Friday evening and was surprised to see them rapidly rising some twenty miles upstream, this isn’t good as that usually takes around twelve hours to reach Daisybank. I checked the levels again at 11pm and the river had continued to rise, not good but by 7am the following morning I could see it was starting to drop so headed off full of expectations as usual. 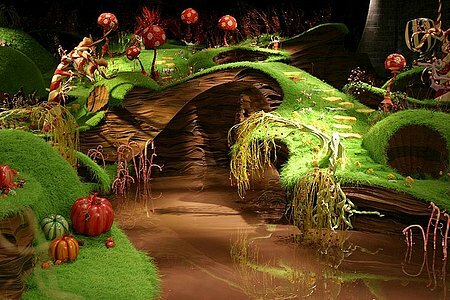 As I came off the M6 slip road I had a quick look at the river, only a fleeting glance but enough to make me contemplate going back on the motorway and head for a local still water, the river was right up and very brown, it would have looked more at home in Charlie and the Chocolate Factory. I decided to continue to Daisybank farm and parked up in the usual spot, oddly enough I was the only angler there and even the ‘not so friendly’ dog was off his lead and came over to say hello. 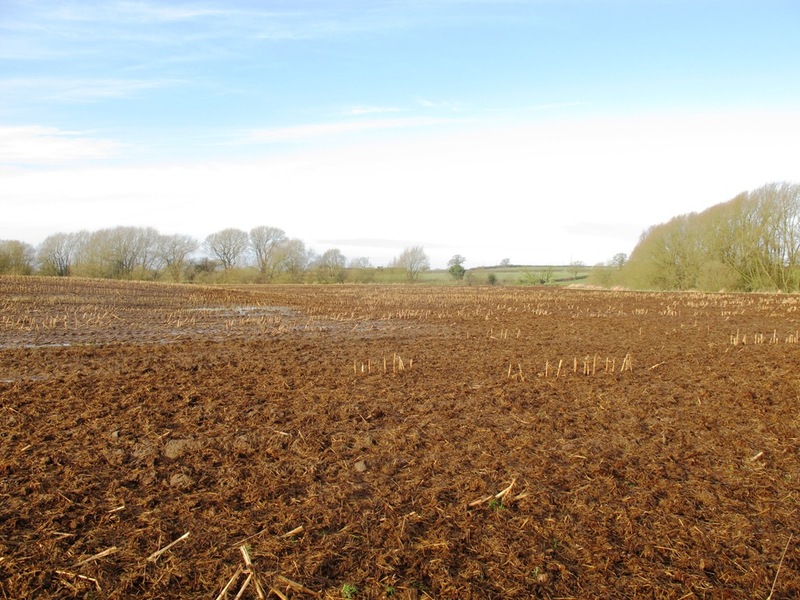 When I reached the river my suspicions were confirmed, it was almost in the fields and very, very muddy looking. 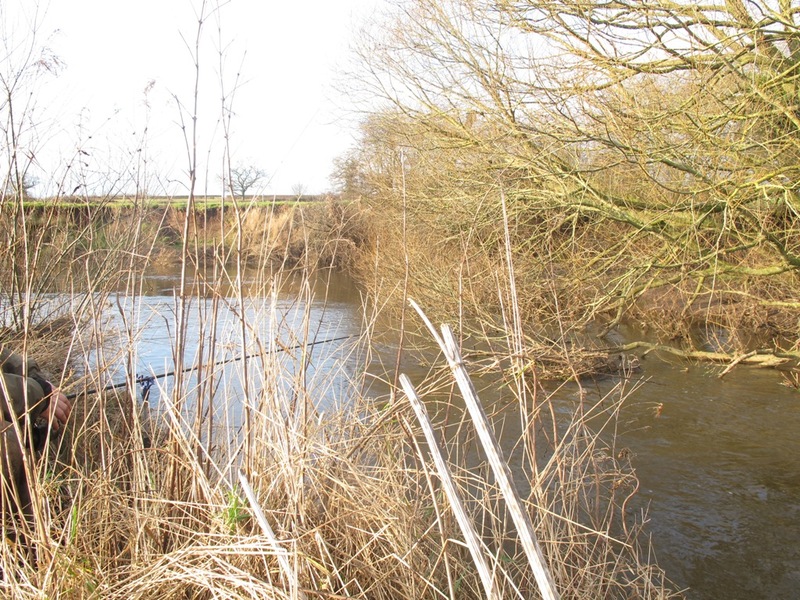 The island was almost completely submerged and I’d hoped to tuck in behind that and fish the channel to the nearside bank as it usually produced a fish or two. I headed back to the sanctuary of the same swim I was on last week, with rain forecast for the afternoon I wanted to get set up and sit it out until the evening. 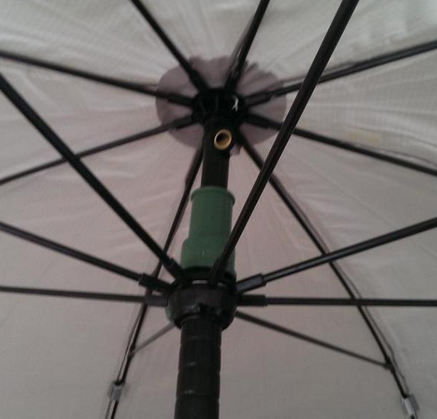 The wind was picking up and I decided to put the new brolly up, I must admit I wasn’t impressed with the ‘feel’ of the mechanism and the Nu-Brolly fitting was difficult to start the pole in, the inner ground spike pole was made of thin aluminium and the thumb screw used for securing it felt like it would dent the inner pole if over tightened. After numerous adjustments I still wasn’t happy with it so I moved my chair and postioned the brolly with it’s back to the wind leaving me sat at a 45 degree angle to the bank, not a problem in itself but the wind was gusting by now and I started to wish I could peg the back of the brolly down properly. 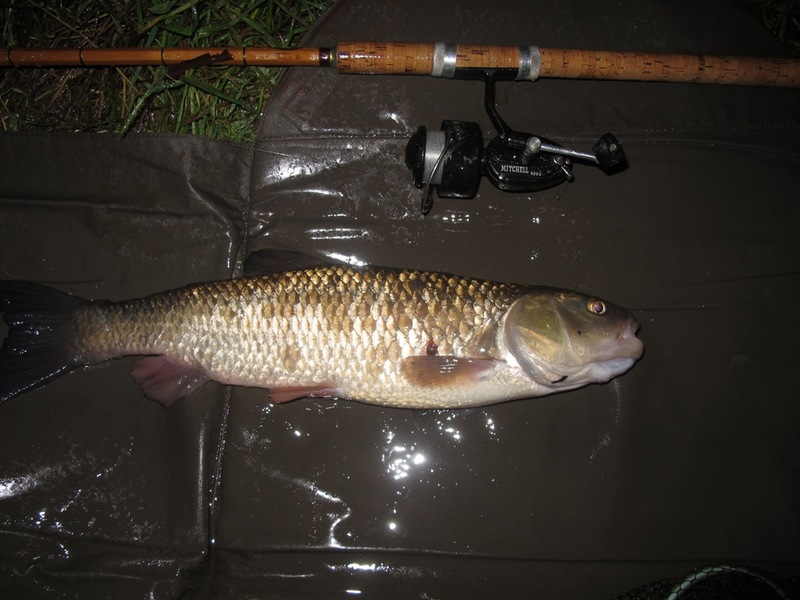 I started fishing and dropped a lump of cheese paste in close to the bush on my right which is where I’d had my first chub on the cane rod and it seemed an even more obvious choice given the conditions. 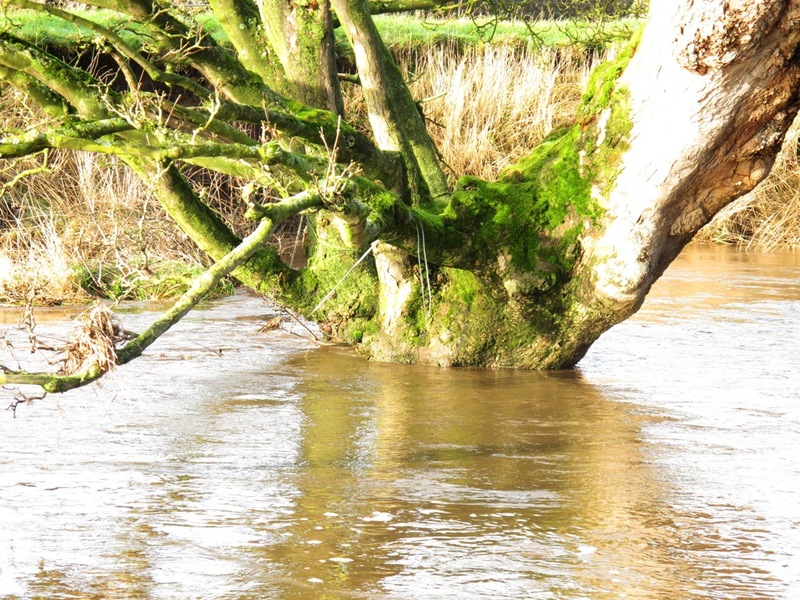 The tree opposite showed how much the levels had risen, the blue rope is usually three foot above the surface but today it was a mere six inches. I’d placed a stick in at the edge to monitor the levels, I knew from the graphs it was dropping but was pleased see it dropping rapidly after an hour. Levels are dropping off rapidly. Meat was next on the menu and I cut it into strips then break off a square giving it a rough edge which I think looks a bit more natural and allows the fatty juices out more than a sharp edge when using a knife. 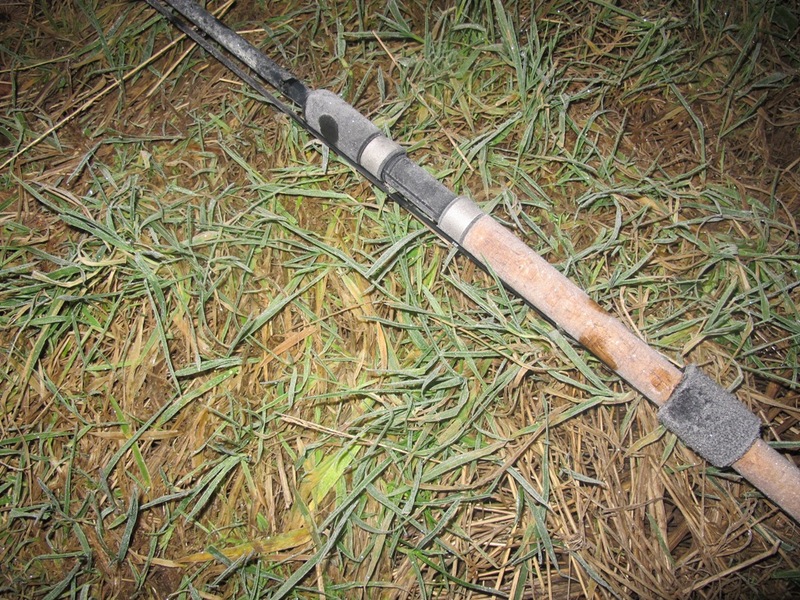 A simple running ledger rig and a size 6 hook was all that was needed, a 2oz lead sufficient to hold bottom behind the bush. The reel I had ‘acquired’ this week was a Mitchell 300 made in 1963, it looked at home on the long cork handle. 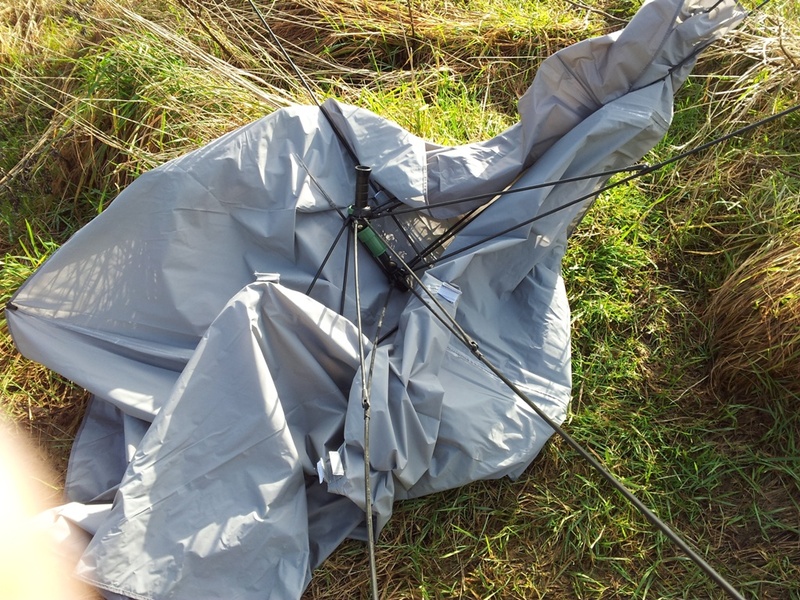 At around 1pm I was thinking about moving out of the wind when a sudden gust caught the underneath of the new brolly and it folded up on itself making the top cap fly off into the undergrowth. I jumped up and tried to save it but it was too late, it was completely destroyed in a split second, not so much of a bargain after all. The dark clouds where getting closer so I decided to make a run for it across the field and drop into the island swim where I knew I’d be sheltered but with my carbon rod strapped to my back in the quiver I realised the thunder and lightning was immediately overhead I started having serious concerns for my safety and wondered if this muddy field would be the last thing I saw!! Eventually I reached the swim only to find it still under water so I quickly discarded the quiver and the 12 foot lightning conductor and huddled down on the floor pulling the skin of the now defunct brolly over me and sat it out, the wind was howling, the rain was bouncing off the river and the lightening was flashing overhead, sometimes, I thought, you’re better off staying in bed. After half an hour the storm had passed so with renewed vigour and a relief that I’d survived I started looking for somewhere to fish, well you can’t keep a good man down!! The obvious choice was the swim on the bend where I’d had my 4lb 9oz PB so I dropped in and arranged the brolly skin so it could be pulled over should the rain return which it did periodically over the next few hours. Darkness arrived and it was bitterly cold so whilst the rain battered down on me I admitted defeat and made a run for it back the car at 6:30pm. It had been an ‘experience’ and one I don’t want to repeat in the future, on the other hand I tend to go fishing when I can at least once a week so I could always buy a new brolly and insulated wellies…..